can phase become an issue? i have an allen & heath mix wizard with 6 Aux sends – 2x pre fade / 2x switched / 2x post fade ideally im wanting to have three independent stage monitors using yamaha 8ohm smv 15"
Far more important than any phasing issues (and it's really comb filtering you're thinking of), the biggest drawback to using linked monitors is that they have the same mix - unless you actively want that. Wonks wrote: Or a powered monitor. yes what's best a powered monitor OR passive with Power amp or just a preference thing ? manleyelop wrote: yes what's best a powered monitor OR passive with Power amp or just a preference thing ? Preference and convenience... but powered monitors are becoming a lot more popular and common. With a powered monitor you need to run signal and power lines to the box, but it's only the one box to rig and pack away. With a passive monitor you need to run a speaker cable across the stage, and find somewhere to put the power amp off-stage... and you have two big boxes to hump in and out of the van! Lots of people here are familiar with the WZ desks -- although there are significant differences between the different versions so you'll need to state which one you're using. I've always found A&H manuals pretty good and easy to follow, and they usually include decent block diagrams that usually make things like routing arrangements and aux functionality very clear. What specifically do you want to know? my confusion is mainly around the St channels 1 to 6 can they all be used for ext fx ? i never use the on board fx i don't like them much they sound horrible to me i would like to turn them off. also what are the 4x auxs for top right of the desk? You really should take the time to go through the manual. The MixWizzes are superb desks with loads of good features. Far easier for you to spend time going through the manual rather than us trying to answer questions out of context. The manual explains how all the functions and facilities interact. That's far better than us giving you piecemeal answers. ... the answer to the '4 auxes' question can be found on P18 of the manual. To configure the mixer as you want use auxes 1-4 for stage monitors - with 3 & 4 in 'pre' mode - and 5 & 6 for FX. manleyelop wrote: my confusion is mainly around the St channels 1 to 6 can they all be used for ext fx ? Yes, in as much as they can all be routed to the stereo mix bus. Stage monitors are usually fed from pre-fade auxes, and effects sends from post-fade. The WZ3 has six auxes, the first two are fixed pre-fade, the next two are switchable, and the last two are fixed post-fade. (Although there are internal jumpers that them all to be switchable, in any combination, if preferred). So in your case, use 1, 2 , 3 and 4 (if needed), for the foldback monitors (with 3/4 set pre-fade), and 5/6 for the external effects sends. ... but as Mike says, it really will pay you to read the manuals and study the block diagrams! Ah! Too far off my patch... if you were closer I'd have offered a 1:1 on an 'expenses only' basis. The beauty of the SOS forums is that we have kind and helpful folk all over the place! Calling members in the Yorkshire area... Eh up lads! Anyone able to help out? iv'e always struggled with grasping manuals im smart but i have to work very hard at taking info in from them hence all the questions. I get that. Most manuals assume a certain level of background knowledge and a prescribed way of thinking, and unless you're on the same wavelength as the writer than can seem rather mysterious sometimes -- especially when it comes to the more obscure functionality. It may help to read a more generalised approach to live sound equipment, and then see if that helps you to translate and understand the specifics of the MZ3/4 manuals. Paul White's The SOS Guide to Live Sound is very readable and would provide a good grounding of most mixer concepts. ... and it's currently on offer from the SOS shop! 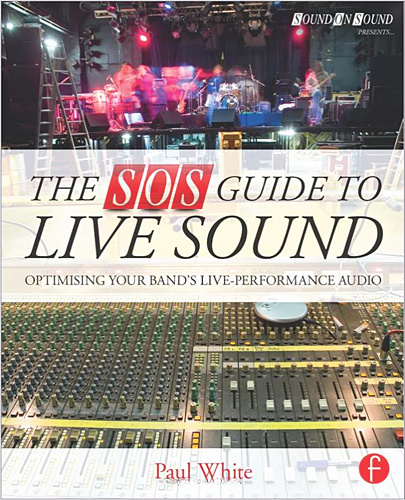 Hugh Robjohns wrote: Paul White's The SOS Guide to Live Sound is very readable and would provide a good grounding of most mixer concepts. But unfortunately out of stock. Ah well... it's available from all good book retailers... and amazon! Just checked. £32.99 from Waterstones! Wonks wrote: Just checked. £32.99 from Waterstones! £20.76 from amazon though im reading back through the Mix wizard WZ3 manual again but slowly it's the ST 1 to 6 routing options that still confuse me but i'll get there.